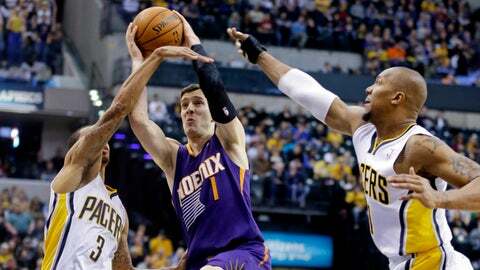 Suns guard Goran Dragic shoots between Pacers George Hill, left, and David West during Thursday's 102-94 Phoenix victory. INDIANAPOLIS — As one of the NBA’s elite teams, the Indiana Pacers have a target on their backs. In four halves against the Pacers this season, the Suns have scored 62 points or more in three of them.